There's a body of research that suggests that some vitamin supplements offer skin-saving benefits. Among these supplements are vitamins A, C and E.
All three of these vitamins are antioxidants. They've shown to prevent or delay some types of skin cell damage. The question is: Should you taking these vitamin supplements to help stave off the signs of ageing? The short answer is no - here's why. 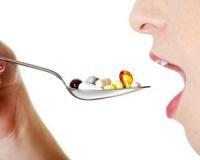 Unless you’re deficient in these vitamins, you don’t need to take supplements. Too much isn’t always a good thing – in fact, research shows that excessive amounts of vitamins A and E, particularly from supplements, might be dangerous. You can get a healthy dose of these vitamins from a well-balanced diet that includes fresh fruit and vegetables, fish, nuts and dairy products. Some solid research has found that you can even apply these vitamins topically to reap their anti-ageing benefits. It’s no wonder these vitamins are found in so many skincare products! However, if you are deficient in some of these vitamins, you should consider taking a daily multivitamin supplement, which you can buy online or at your local pharmacy. As always, check with your doctor before adding supplements to your regimen, as some of them can have unwanted medication interactions or side effects. Researchers have just revealed promising research on what may be heralded as the "missing link" in beauty science... A single nutrient that has the power to tap into the process inside the body that determines how fast - and how well - you age. Now, armed with this final coveted piece of information, we've developed a simple but extraordinarily powerful way to stop fading beauty before it's too late. This innovation has the potential to keep you looking fresh and flawless no matter how many times you've celebrated your "29th" birthday. And, in what may be the most stunning part of all, this youth-restoring breakthrough goes to work while you sleep. What about collagen supplements for youthful-looking skin? You’re probably also curious about collagen supplements, which are often touted to help restore the structure of the skin and reduce the depth of wrinkles. While research on the safety and efficacy of collagen supplements is still in its early stages, some studies look promising. One thing we do know for sure is that it’s fine to consume collagen-rich foods like bone broth. To learn more about why bone broth is one of the most healing diet staples, go here. Are you lacking in the vitamins you need as you age? Beware: These three foods make you look older! Can supplementing with collagen really help reverse ageing?